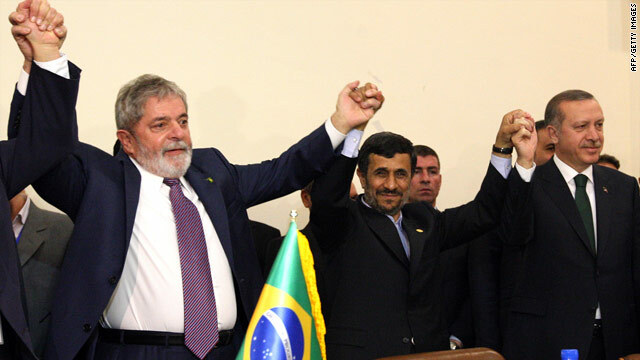 Brazilian President Luiz Inacio Lula da Silva, Iranian President Mahmoud Ahmadinejad and Turkish Prime Minister Recep Tayyip Erdogan broker a nuclear deal. Obama questioned whether Iran would engage "in good faith"
Washington (CNN) -- Even as the United States pushes at the United Nations for sanctions against Iran's nuclear program, three senior administration officials, in a hastily scheduled briefing for reporters, tried late Friday to tamp down a dispute with two allies over the Islamic Republic. The dispute sprang from a high-profile diplomatic foray on May 17, in which Brazilian President Luiz Inacio Lula da Silva and Turkish Prime Minister Recep Tayyip Erdogan signed a fuel swap agreement with Iran. Under the deal, Tehran agreed to hand over nearly half its low-enriched uranium to Turkey in exchange for medium-enriched uranium needed for a nuclear reactor that produces medical isotopes." Such a fuel swap is part of a series of plans Western nations have proposed to persuade Iran to stop enriching uranium, which the United States and other nations fear it will use to make nuclear weapons. Iran insists that its nuclear program is peaceful. Within hours of signing the agreement in May, however, Iran announced that it would continue to enrich some uranium. Later, U.S. Secretary of State Hillary Clinton dismissed the pact, saying Brazil, which brokered the agreement, was being "used" by Tehran. The Brazilian media this week published a letter, dated nearly a month before the agreement was signed, from President Barack Obama to the presidents of Brazil and Turkey outlining the points he considered necessary for a fuel swap agreement. In the letter, Obama said, "I question whether Iran is prepared to engage Brazil in good faith." The officials tempered their criticism, saying Brazil and Turkey were "genuinely looking for a way to make progress" and that the United States recognizes "the sincere efforts made by Brazil and Turkey." But, one added, "unfortunately, the motives of their partners (Iran) were quite different." They also told reporters the April 20 letter was "not intended as negotiating instructions." The Brazilian president said his deal met the requirements for a fuel swap detailed in Obama's letter, but the U.S. officials said Friday that a fuel agreement was just one aspect of the stand-off with Iran and the deal struck by Brazil and Turkey "fell far short of what is necessary" to end international sanctions on Iran. Further, they said, the deal did not address the core issue: whether Iran's nuclear program is for peaceful purposes. The United States is working with the full U.N. Security Council on a new sanctions resolution, the officials said, and has made "good progress." Iran, however, continues to enrich uranium, which the officials called a "big step toward weapons-grade" fuel. They said that last September, Iran had 1,200 kilograms of low-enriched uranium. Since then it has doubled its stocks to 2,400 kilograms, maintaining a "steady pace" of production, they said. The low-enriched uranium contains about 3.5 percent uranium-235, the isotope that can sustain a fission chain reaction. Under the Brazil-brokered agreement, Iran would hand over about 1,200 kilograms of its low-enriched uranium and in return would receive 120 kilograms of medium-enriched uranium, containing 20 percent uranium-235, the threshold for highly enriched uranium. Uranium containing 85 percent uranium-235 is considered weapons-grade uranium. Crude and largely inefficient weapons can be made with as little as 20 percent, however. Little Boy, the atomic bomb dropped on Hiroshima, Japan, in 1945, contained 64 kilograms of 80 percent uranium-235.